The new pacesetters made it seven league wins in a row with a five-wicket success at home to a Hastings side which had won its previous five matches. Hastings were all out for 78 in 38 overs after choosing to bat, losing three wickets with the score 59 and three more on 64. Joe Lamb (27) was the only batsman to score more than 13 as Hayden James ripped through with 6-25 from 18 overs. Lindfield needed just 18.4 overs to finish the job, Shane Wilson-Yelverton leading the way with 31. Henry Smith (3-38) and Elliot Hooper (2-11) were the Hastings wicket-takers. Third-placed Worthing kept themselves within touching distance of the top two with a 32-run success at home to Ifield. Worthing were all out for 153 batting first despite an opening partnership of 111 between Matthew Green (62) and Josh Wood (48). Guru Kedarnath and Jigar Parekh brought about the collapse with 6-36 and 3-41 respectively. Ifield were all out for 121 in reply, with only Kedarnath (30) scoring more than 22. Andrew Lutwyche was Ifield’s chief tormentor with 5-44 from 11.5 overs. Three Bridges are also very much in the promotion picture after winning by six wickets at home to Ansty, who were all out for 133 after choosing to bat. Jethro Menzies top-scored with 50, while Matt Blandford took 4-40 and Michael Rose 3-19. 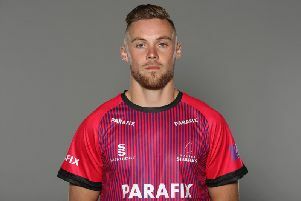 Bridges reached their target in 30.3 overs thanks largely to the runs of Bradley Gayler - whose 53 took him top of the league’s scoring charts - and Danny Alderman (46 not out). Menzies completed a good day personally with 3-45. Bottom side Crowhurst Park ended a run of nine straight league defeats with their first league victory of the season - a four-wicket triumph away to Findon. The hosts recovered from 67-7 to be all out for 174 after electing to bat. Ben Jordan made 51 not out at number nine and Glenn Bridson hit 38, while Paul Brookes bagged 6-59 from 25 overs. Park knocked off the runs in 36.2 overs thanks largely to Bradley Payne (56 not out), Rakesh Patel (44) and Dale Payne (31). Harry Metters took three wickets for Findon. In the division’s other game, Pagham and St James’s Montefiore contested a high scoring draw in which more than 550 runs were scored. St James’s amassed 305-3 declared batting first with Henry Sims (118 not out) scoring his maiden Sussex League century, Sam Cooper making 60 and Mali Richards 50. Pagham got to 255-8 in reply courtesy of an unbeaten 121 off 118 balls from Eranga Dissangge. Jordan Shaw, Richards and Edward Blake all picked up two wickets. Standings (all played 10 matches): 1 Lindfield 242pts, 2 Hastings Priory 231, 3 Worthing 209, 4 Three Bridges 205, 5 Pagham 194, 6 Findon 184, 7 St James’s Montefiore 151, 8 Ansty 129, 9 Ifield 126, 10 Crowhurst Park 74.